Welcome and thank you for visiting Snarly Sally! When my oldest daughter was a toddler hair-brushing time was a battle. With long, thick hair, her snarls were huge and my patience thin every time it was “that” time. I’d struggle to keep her sitting still while I tugged and pulled her hair. Conditioner and other products helped but the battle raged on. When she reached kindergarten age I became desperate for a solution. My daughter loved books; loved it when I made up stories so that is what I did. I told her stories about this little character who didn’t like to have her hair brushed and most days it worked. Early on, thinking other little girls and their moms would love to read about Snarly Sally, I sent the original story to some big-name publishers. I waited anxiously for a glowing acceptance letter. All I received were form rejections. I kept sending the story out. I kept being rejected. I had so many rejections that I began collecting them in a big box! I eventually changed the story by giving Snarly Sally a little puppy named Tangles. That didn’t work so I decided that if I found an illustrator that might open the door. But I discovered that even though the art samples sent to me were amazing they weren’t the Snarly Sally I envisioned. My children suggested I should be the illustrator of Snarly Sally. I panicked. I had no art background. But I decided to try. I went to the library and read about various mediums. After a few years of hit and miss I chose markers and colored pencils. I began illustrating. After my contract with Landauer expired I decided that I would not only be the creator, writer, and illustrator of Snarly Sally. I would also be the publisher. 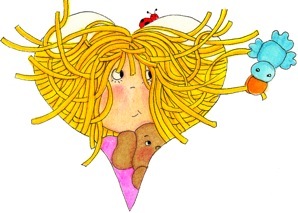 That decision has resulted in this exciting and fun website where we are happy to introduce the 3rd Snarly Sally book, “The Great Hairy Scary Butterfly Rescue.” Not only is the book new so is Snarly’s look. She's traded her dress for a pair of jeans and hot pink top-making it easier for her to go on even more adventures! Tangles has changed too but that’s all that has changed. Children’s imaginations will still ignite as they join Snarly Sally and Tangles in another fun-filled story. Please keep checking this site; grow with us as we add product, more titles, and downloads. I invite you to send me your stories about your Snarly Sally. Include a picture if you’d like and we will post them to share with other Snarly Sallies and their families. After all, everyone knows a Snarly Sally! Thanks to everyone who kept encouraging me and supporting me. This long journey is your journey too. 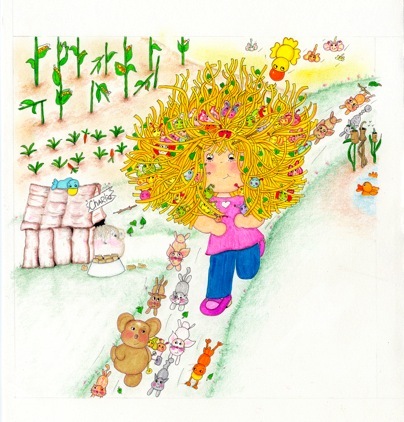 "The Really Hairy Scary Butterfly Rescue"
"My children and I LOVE this wonderful, imaginitive story. Snarly Sally and her dog Tangles are so adorable; they have become part of our night time reading ritual. We are looking forward to more fun adventures with these two very special characters! "